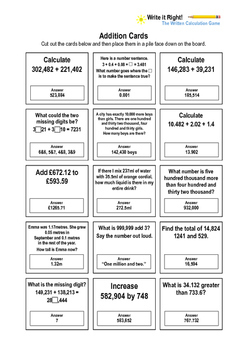 I created this as a four week homework programme for my class to practise their calculation methods whilst encouraging parental involvement. 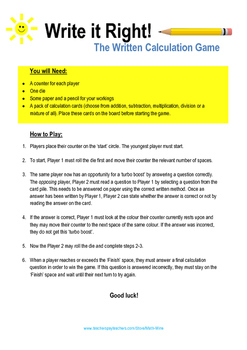 The questions require children to work with large numbers up to 6 digits long, decimals with up to 3 decimal places and also include long division and long multiplication. I asked the children to record who they had played the game against at home and encouraged them to play for 10 minutes a day to practise their written methods. 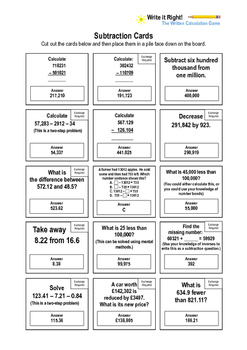 I have seen huge improvements in my Year 6 class's written calculation skills as a consequence and many parents have commented how it has helped them to understand the calculation methods too. 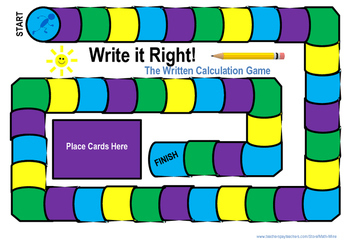 I designed this as a fun game to practise the written methods of calculation. Although I chose the option of encouraging the link between home and school and asking the parents to join in too, alternatively you might decide that the game is best in your school to be played in the classroom as a morning starter or within intervention sessions. A set of instructions is included.